Margo Candela's Good-bye To All That is our featured book in March, but I wanted to check out some of her other work as well. It dawned on me after reading More Than This that this was the first time I've read a chick lit book that featured a Latino love interest. A lot of times, if it's a book about a woman of color, her love interest is a Caucasian male or male of her own ethnicity. This time around we're lucky enough to meet the handsome and well-spoken Alexander Velazquez, attorney-at-law. Occasionally I cast characters in my head and share them with you. Well I didn't cast everyone this time around, but I did cast Alex. 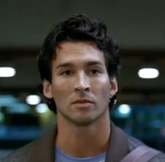 I have no idea what this actor's name is, but he's from one of the AT&T Re-Think Possible commercials. Is that McDreamy enough to make you pick up the book? No, okay, then let me tell you why you should. It's a boy meets everyone except girl story. Huh? What? Right. Throughout the entire book the very wealthy Evelyn Morgan is traveling the path to discover who she really is. After some time in Paris, where she worked at being a struggling artist, she's back in San Francisco. A case of mistaken identity leads to a job at a local dot com firm. Though it started off as some harmless fun, Evelyn finds herself dedicated to the company and the tasks before her. Rebounding from a relationship gone wrong and a newly ended job, Alex Rodriquez has moved back to San Francisco from New York. When he stops by to visit his friend Pete at work, he walks out with an offer to join the firm and take on one of its most lucrative contracts. That wouldn't be so troubling if working with the client didn't go against everything he was raised by his parents to believe in. As Evelyn and Alex move through their lives, there are so many instances of near encounters that don't happen. Ironically, their offices face each other and even though they're aware that the other exists, neither realizes that they're being admired from afar. I loved the family dynamic that was explored on each side. I especially loved Alex's parents. Every time the main characters were in the same vicinity, I kept hoping that they were finally going to meet and each time, I was disappointed. Have the characters meet earlier.